At Fleming Metal Recycling we have an extensive range of mobile metal processing equipment which enables us to under-take demolition and site clearance contracts. Before any works are undertaken, FMR has a stringent risk assessment and pollution control procedure and are committed to delivering on our contracts according to the specification of you, our customer. 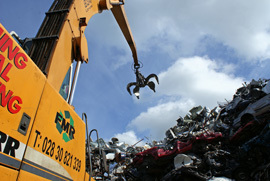 FMR at all times will seek not only to ensure that our customers get exceptional value but that also the maximum possible level of scrap metal recovery is achieved. 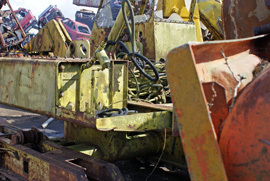 Whether it is building removal, factory clearance, dismantling plant & machinery or the clearance of your site of end-of-life vehicles and other scrap metals, at FMR we can provide the full range of services that you require.